For the Vatican Tour, English is the default language. Please note that alternative language options are subject to availability, call to confirm. Visit Rome and don't worry about anything! Buy this supersaver package deal, sit back and relax. Take the stress out from your arrival in Rome (either Fiumicino or Ciampino Airport) and enjoy a comfortable shared transfer shuttle to one of the most central hotels in the city, Hotel Diana. This 4-star property is located by the Opera Theater, set in an area close to the Central Station, which is a great choice for travellers interested in architecture, monuments and ancient sights. 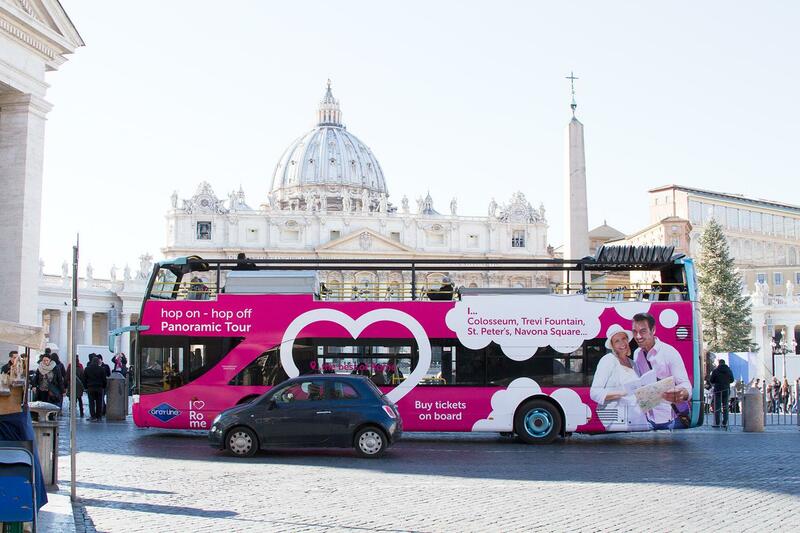 During your stay, discover our pink hop on hop off sightseeing buses which are on the move all day long. With a 1-loop ticket included in the package, the bus will take you to the city’s most important monuments. Buses run daily, approximately every 30 minutes at 11 different bus route stops between 9:00 AM and 6:30 PM. Your entire loop, without stops, takes about two hours in good traffic. On board, a very informative audio-guide will supply you with the unique history behind Rome’s visual splendor, providing plenty of information to enrich your experience. To top it all, take advantage of an amazing tour included in the deal: Vatican Museums, Sistine Chapel & St. Peter's Basilica with hotel pick-up. Enjoy a professional guided visit of the Vaticans skipping long entrance lines. Endure no stress to reach the area: upon arrival your guide will lead you into the Museums through our preferres entrance, hence you'll visit one of the most important art collections of the world. On the last day of your Roman stay, be accompanied back to the airport. Transfers were prompt and drivers were courteous. One comment would be to use guides for the transfers who are at least bilingual, if not multilingual. The Vatican City tour was good, the tour guide was excellent. However, the hop on hop off ticket was a disappointment, you should include the ticket that ALLOWS one to hop on or hop off. We had to pay E16 more to upgrade our ticket and it was a convoluted and anxiety creating process. The staff is friendly and helpful. Clean rooms. Although it was difficult to use the shower without getting the floor completely wet. We're glad to hear you enjoyed your tour! We apologize for your having to book over the phone, and we'll take a look at our site to ensure that issue is fixed.